New DVD and CD projects from Hall of Fame vocalist and five-time Grammy winner, Larnelle Harris, have been released via Seaboard Records/Captial Christian distributors (formerly EMI CMG). 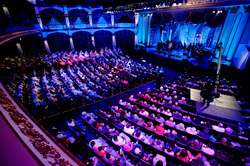 The projects entitled Larnelle Live in Nashville feature a live concert performance from Harris along with guests Sandi Patty, Steve Green and Steve Amerson. In addition to singing several of his hit songs, Harris also performs new tunes on the audio and video projects, including a brand-new duet from Harris and Patty. The duo’s previous two duets, “More than Wonderful” and “I’ve Just Seen Jesus,” both won Grammy Awards. Among other highlights, Harris is joined by Green and Amerson in a special “Three Tenors” performance segment which the trio debuted last year at Carnegie Hall. Harris is the only person in history to be a member of three distinct hall of fame organizations: the Gospel Music Hall of Fame, the Kentucky Music Hall of Fame and the Amateur Radio Hall of Fame. In addition to his five Grammy and eleven Dove Awards, including being named Male Vocalist of the Year three times by the Gospel Music industry, Harris has garnered nineteen #1 national radio singles and countless top 10 hits. Songs such as "How Excellent Is Thy Name," "I Miss My Time With You," "I've Just Seen Jesus," plus many others, including his signature song, "Amen," are now considered modern gospel classics. From the White House to the 38th Parallel, Harris has impacted audiences across the globe with his music. He was the first gospel artist to perform inside the Kremlin after the fall of the Soviet Union. He is one of a handful of celebrities to receive the Ad Council's Silver Bell Award for Distinguished Public Service in recognition of his song "Mighty Spirit" as the theme song for the longest-running Public Service Announcement in television history. For more information on Harris, visit www.Larnelle.com.